Maintenance Connection - 2019 Pricing, CMMS Features and Testimonials. Work Order Management, Equipment Inventory Management, as well as Preventive and Predictive Maintenance are some of the top features of Maintenance Connection. Eliminate spreadsheet based maintenance programs. 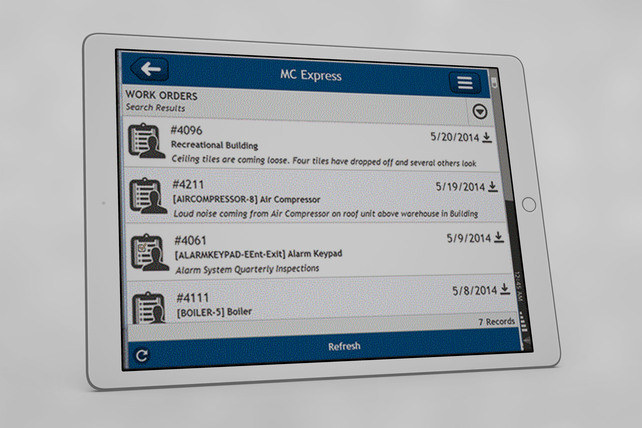 Become paperless and equip your field service teams with mobile maintenance management capabilities. Create a single source of information for your planned, preventive and reactive maintenance activities. Improve equipment uptime by implementing your planned maintenance work orders. Improve field service management capabilities by easily reviewing work order book, backlogs and resource availability. This product develops maintenance intelligence that forms the basis of improving life of your enterprise assets, optimising material and labour costs and improving internal and external customer satisfaction. Get the right balance between planned and reactive maintenance plans. Import equipment inventory from existing sources using spreadsheet. Supports mobile-device based barcode scanning to read equipment details. 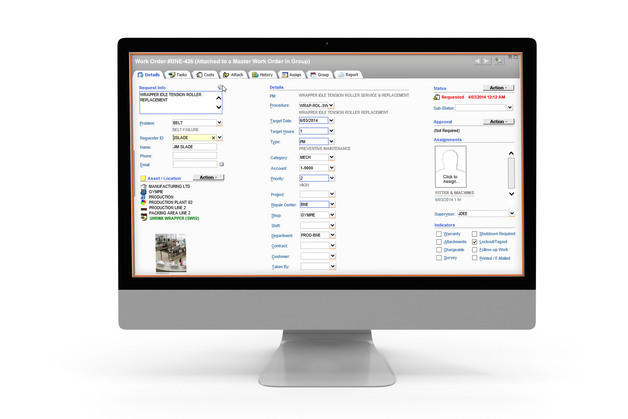 Reorder replaceable items from within the system, or use automated reordering functionality. Track equipment inventory across multiple locations. Link equipment inventory with any work order and asset. Define approvals required to purchase inventory. Receive inventory against a purchase order. View assets in a hierarchical structure. It also enables you to copy, paste, drag, and drop them around the structure. Create work orders using minimum information. Requester, asset, location and job instructions can be chosen from drop down options to create work orders quickly with sufficient information. Easily define and assign maintenance tasks. This product also provides detailed instructions, materials used, attachments, failure analysis and other details. Easily search through your work order book. Access, review and close work orders from a mobile or smartphone device. Field teams can record time and materials with ease. They can also add pre-inspection and post-completion pictures to work orders. Improve your job completion rate by benchmarking work order completion rate. Also, you can easily assign work orders to available resources. Work orders can be linked with assets and people, making it easier to track maintenance and labour costs by equipment. Easily get to know budgeted vs actual costs. Engineers can easily record actual time spent on jobs. Create a central repository of preventive maintenance program which can be accessed by both office and field based teams. Automatically create work orders based on pre-set operating threshold levels. Create preventive maintenance work orders based on time/intervals and meter readings. Set up multiple work order procedures per equipment. Alerts your teams proactively about upcoming work orders. Easily monitor work order assignments. Schedule preventive maintenance activities based on meter readings and cycle counts. Use historic equipment data to predict maintenance programs and equipment output capacity. Categorise assets based on their behaviour and inspection needs. Flexibility to record predictive data, from inspection and work order instruction manuals to creating predictive maintenance schedules. Expert condition monitoring to identify both obvious and non-obvious failures. Identify trends from predictive maintenance data to repair, replace or retire equipment. Availability based preventive maintenance allocation ensures resource utilisation. Offers a holistic framework to your overall maintenance and plant uptime program. You can drive single maintenance culture, program and activities across all your sites using Maintenance Connection. Plan budgets and operations for the complete enterprise, and monitor them at the enterprise and site levels. Offers a common place to share: equipment inventory, leased maintenance equipment, resources and maintenance best practices. 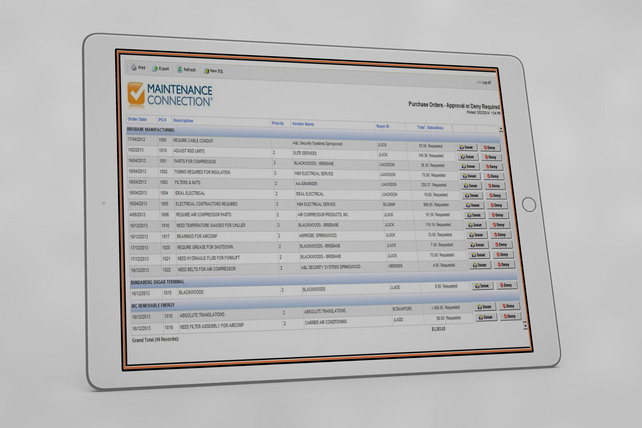 Over 150 standard maintenance reports offering insights into work order book, predictive maintenance, CMMS programs, resource availability, resource performance, failure, replacement, repair, requester, preventive maintenance and other key areas of standard maintenance program. Easy-to-understand and Easy-to-use Report Filtration options, making it easier for office and field based maintenance teams to get deep insights from your maintenance data. Compare and benchmark key performance indicators to identify outliers and anomalies from your CMMS program. Organise your reports to support the hierarchy of your organisation and maintenance plan. Structured view of reports facilitates the interpretation of maintenance data. Defines the fields and information that are mandatory or optional to log service requests. A simple yet comprehensive service request capability makes it easier to log service requests. Service requesters can review service status of their requests. For example, whether a work order has been issued or a technician has reviewed the request. Track every stage of your equipment lifecycle from capital planning to procurement and all the way to disposal. Maintenance Connection offers insight to Accounting and Production teams, making it easier to plan a coordinated long term maintenance plan. Offers comprehensive and complete maintenance management features for office as well as mobile/field based teams. You can deploy an On-premise or a Cloud-based Solution. 98% customer satisfaction from users of this product. The system has enterprise users like GE, Nissan, and Honeywell. It is used by over 1000 small and medium businesses from various industries.